This lovely studio accommodation is on the outskirts of Cloughton near to Scarborough and can sleep two people. 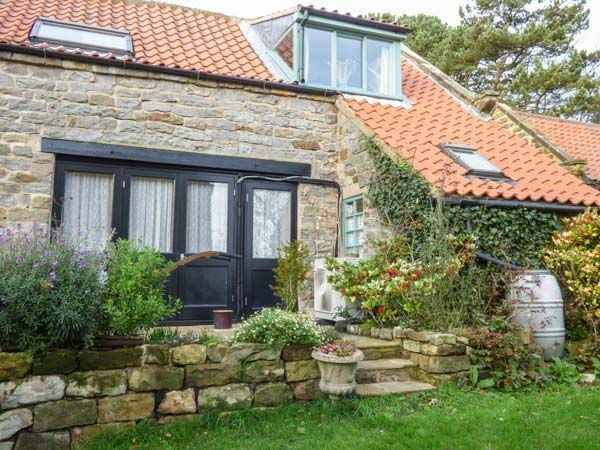 The Hayloft is a lovely studio apartment situated on the outskirts of Cloughton, just four miles from Scarborough on the edge of the North York Moors National Park. The cottage can sleep two people and has a double bed with a sitting area and a separate bathroom. Also in the cottage is a kitchen with dining area. Outside is roadside parking and a private patio with furniture. The seaside town of Scarborough has much to offer, with its sandy beaches, castle ruins, pretty gardens and seafront cafes and restaurants. The Hayloft is a delightful cottage with superb views in a lovely part of Yorkshire. Amenities: Air source central heating. Electric oven and hob, microwave, fridge/freezer, washing machine, TV with Freeview, DVD, selection of books and DVDs. Fuel and power inc. in rent. Bed linen and towels inc. in rent. Roadside parking outside property. Patio with planted border and furniture. Sorry, no pets and no smoking. Shop 1 mile, pub 5 mins walk. Note: Access to property is via a farm gate across a lawned area. Town: Cloughton lies 4 miles north of Scarborough, on the edge of the North York Moors National Park. With mainly old cottages lining the main street and more modern developments behind, the village has two pubs on the main street and one on the outskirts. Close by is the popular 'Cinder Track', the disused 23 mile long railway track, that is for walking, cycling and horse riding. There is easy access to the Cleveland Way long distance trail that hugs the cliff top as it winds its way to Scarborough. Popular since Victorian times, this vibrant seaside town retains many of its original fine buildings, parks and gardens, as well as its historic castle which overlooks the town. North Bay and South Bay provide two superb stretches of beautiful, golden sandy beaches, popular with families and small children. There are a number of child friendly activities and many excellent visitor attractions for grown-ups too, including the Stephen Joseph Theatre, Scarborough Spa and Scarborough Open Air Theatre for live music. Scarborough is a great location for outdoor activities, with golf courses, lovely coastal walks along the Cleveland Way, stunning cycle routes such as the old railway to Whitby, beautiful sailing and championship quality surfing. Add to this all the usual seaside entertainment and bustling promenades located close to the beach and Scarborough is the destination with something for everyone. Ideally situated for touring the coastline and the moors, Scarborough is an ideal base for a fun-filled break. Open plan first floor studio accommodation with double bed and sitting area. Ground floor bathroom with hip bath, shower over, basin and WC. Ground floor kitchen with dining area. Air source central heating. Electric oven and hob, microwave, fridge/freezer, washing machine, TV with Freeview, DVD, selection of books and DVDs. Fuel and power inc. in rent. Bed linen and towels inc. in rent. Roadside parking outside property. Patio with planted border and furniture. Sorry, no pets and no smoking. Shop 1 mile, pub 5 mins walk. Note: Access to property is via a farm gate across a lawned area.